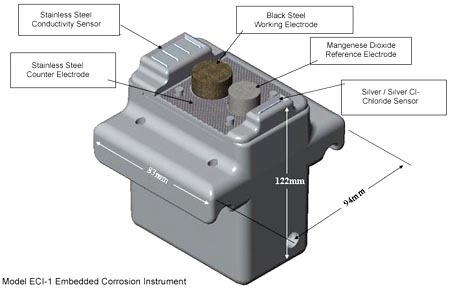 The Embedded Corrosion Instrument product line from Virginia Technologies, Inc. consists of the ECi-2 corrosion monitor and NetCon-10 interface module. The ECi-2 is a monitor for steel-reinforced concrete structures, using non-destructive evaluation (NDE) to provide early warning of conditions that can lead to cracking, spalling, delamination, and other deterioration. The NetCon-10 is a connection module. It helps organize large networks of corrosion monitors and guards them against voltage spikes. The ECi-2 is comprised of sensor electrodes and processing electronics, integrated within a molded plastic enclosure. It monitors five key factors in the corrosion of steel-reinforced concrete structures – linear polarization resistance, open circuit potential, resistivity, choloride ion concentration trend, and temperature. In this way, the ECi-2 provides substantially more comprehensive data than prior generations of sensors. That, in turn, reveals correlations among the causes and signs of corrosion, and yields a fuller, more certain picture of the threat. The ECi-2 is a non-destructive evaluation (NDE) device. It gathers and transmits data on corrosive conditions within steel-reinforced concrete – without requiring inspectors to cut physical samples or interrupt use of a structure. This reduces the costs of inspection and repair. It also minimizes disruption to the users of a structure – a vital consideration in the maintenance of bridges, buildings, dams, erosion control structures, flood control channels, parking garages, piers, pylons, roadways, and spillways. The ECi-2 was designed for use in all of these structures. Each ECi-2 is a digital peripheral instrument on a local area network, embedded within the structure that it monitors. It communicates with other instruments on its network – and with an external datalogger – using the SDI-12 industry standard protocol. By communicating digitally, the ECi-2 guards against data corruption by electro-magnetic interference. The ECi-2 continuously and automatically reports its readings to any SDI-12-compatible datalogger. This enables managers to download that information by wireless transceiver and cellular modem – without visiting the structure site. Already digital, ECi-2 data can easily flow into a computerized structure management system. This makes it possible for managers to organize and analyze maintenance information electronically. That, in turn, helps them anticipate problems before they become crises, and schedule inspections and repairs at the lowest possible cost. ECi-2 networks are scalable to the size and needs of any structure. During construction, ECi-2 monitors may be embedded in two classes of location – in the areas most vulnerable to corrosion, and at a sampling of points that are representative of the structure as a whole. As each ECi-2 is uniquely addressable, the size of this network is limited only by the number of datalogger ports available to receive ECi-2 readings. For structures where this becomes a constraint, Virginia Technologies offers the NetCon-10 interface module. NetCon-10 makes it possible to connect not one, but 10 ECi-2 monitors to each datalogger port. It also provides fuse protection for ECi-2 monitors, guarding them against voltage spikes on power and data lines. It uses LED indicators to identify open fuses, helping facilitate trouble-shooting. The ECi-2 system is powered by a rechargeable gel-cell battery, which can draw power from the local electric grid or from an optional solar panel. WILSON TAYLOR ASIA PACIFIC PTE LTD.